In 2017 MMR Healthcare saw the urgency for the 65+ community to receive the flu vaccination. The outbreaks of the flu were record-breaking. The accounts of death or hospitalization in areas of geriatric care were troubling. Dr. Rodriguez paid extra attention and realized that patients forgot they needed the shot, were reluctant to get it, didn’t know where to go or were not aware of the proper time to get the flu shot for full effectiveness. That is why Dr. Rodriguez teamed up with Family Care Pharmacy Rx to create the Flu Clinic. Together, they established a place of authority for flu shot care. This has become a place where patients can receive flu shots for free, along with advice from doctors and pharmacists on how to prevent or care for flu symptoms. This is an important resource for senior citizens in Palm Beach County and beyond. You can start making appointments with MMR Healthcare today. 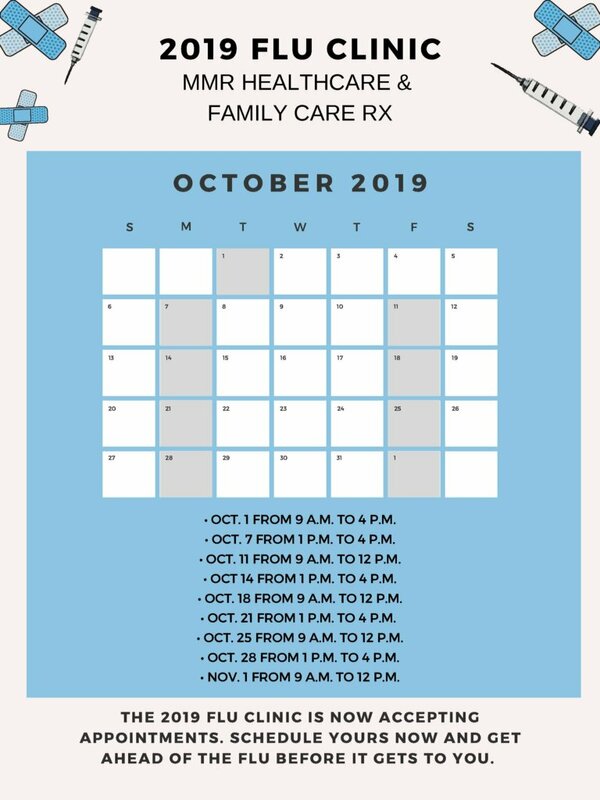 Appointments will begin October 1st and continue until November 1st. You may review the schedule below. Call (561) 364-8056 today to make your appointment! The Centers for Disease Control and Prevention (CDC) highly recommends for everyone to receive their flu shots starting October 1st. This is to be sure that you are covered for the entire flu season. Make sure to book your appointment sooner rather than later. Our mission is to have transparent communication, to promote the team approach to patient care and to provide quality healthcare for all patients.